This album spread contains two photos taken during a at Black Creek Pioneer Village wedding. 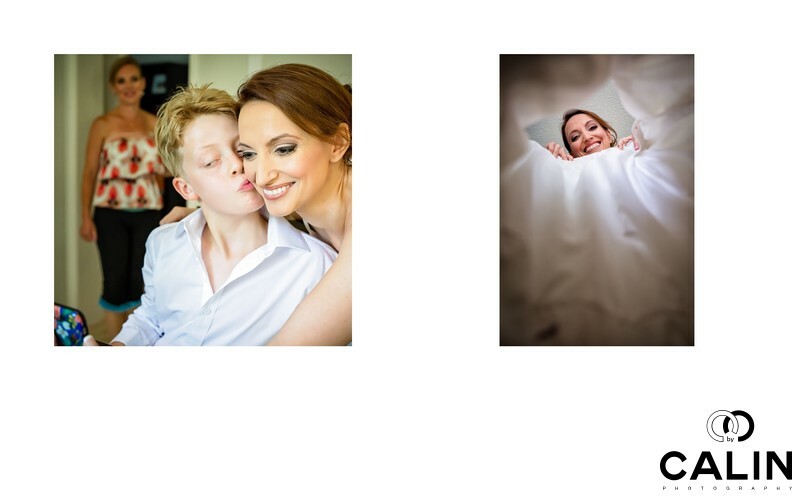 The image on the left features the main subjects, the bride and her son and was captured before the wedding ceremony, more specifically during the bride preparation. To give the image dimension, there is one of the bridesmaids smiling in the background. The second image, on the right page of the album spread, presents the bride looking down through her dress. Selfies are omnipresent these days and a selfie with your mother on her wedding day is priceless. Still, despite the fact this shot looks natural, I staged it. When I saw the bride's son taking selfies with his mother, I asked the guests not to jump into the scene and one of the bridesmaids to stand behind them. My request was so unexpected that the bridesmaid started laughing. As a wedding photographer I have to improvise to get the right shots. By placing the bridesmaid in the background I added a new layer, which gives the image more dimension. If you wish, it makes it three dimensional. This shot of the bride looking down her dress is super fun, especially if you can see it behind the scenes. Seconds before the bride got into her dress, I laid on the floor on my back and asked her to bring the dress above my lens. The result? The dress became a tunnel and I asked the bride to look down at my lens through the tunnel. The photographic composition in this frame is impeccable. I placed the bride in the middle of the golden spiral. Location: 1000 Murray Ross Pkwy, North York, ON M3J 2P3.